The Measurements of Decay is an ambitious novel, filled with creative world-building and lavish language. 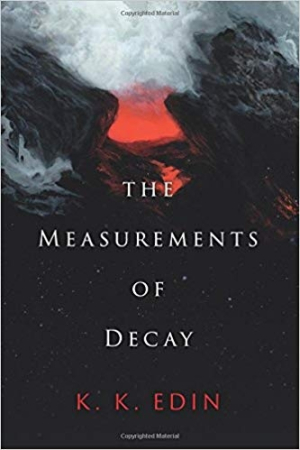 K. K. Edin’s The Measurements of Decay is an ornate science fiction thriller that examines the shifting tides of moral ambiguity and individual perceptions of humanity in a world dominated by hallucinogenic dreaming automatons. The story spans thousands of years across universes. In the present, a philosopher leaves his lover and escapes to Paris in order to work on a theory of human consciousness that will justify his own moral decline and advance his delusional views on humanity. In the future, an outcast crusader named Tikan becomes disillusioned with humanity’s reliance on technologies that turn dreaming humans into automatons and vows to destroy the powers-that-be who hold humanity hostage. A young woman named Sielle who is born during the Russian Revolution finds herself weaving between times and universes, seeking to affirm her faith in humanity even as tragedy strikes. When the past, present, and future inevitably collide, only Sielle holds the key to preventing humanity’s collapse. The central themes revolve around knowledge, its subjective use to corrupt existing power structures, and love. The love story between Sielle and Tikan is a particular highlight of the story, serving as the canvas against which the other two themes play. The main characters are vivid. Their interactions with others define their individual perceptions of humanity and human consciousness. The story’s secondary characters serve as the corrupt mirrors to Sielle’s and Tikan’s ideas of freedom and humanity and as fuel to further the corrupting influence of the philosopher. Futuristic worldbuilding is another highlight. It alternates between vibrancy and bleakness. On future Earth, inhabitants no longer speak; they survive through instinct and habit. In the dome-encased uniformity and artificiality of Proxima, the site of much of the action in the story, inhabitants spend their waking moments escaping into simulated, robotic dreams through the brain-embedded procrustus. Their actions are controlled by the procrustus. The mirror world of Zotharra is a colorful, psychedelic dystopian paradise “wreathed in thundery mist” whose inhabitants survive by deistic fear of the Great Zotharra. Language is complex and full of haunting and horrifying imagery: “The grunting came from an older man of about fifty or sixty, who sat with his heels to the wall, facing a sleeping pod and carving a hole into his head.” The philosopher waxes poetic on the streets of Paris and invokes Greek mythology to justify his own perceptions on human consciousness, but his reflections run long, establishing his narcissism and doing little to advance the plot. Language links to the past, while its lack characterizes the future. Sielle’s and Tikan’s narratives alternate between straightforward dialogue and complex exposition. This gives the story an exciting pace. Complex phrases emphasize the characters’ romanticized ideals and communicate the depth of their feelings. Still, the ending falls flat compared to the elaborate build-up to it.